Calvary Cemetery was established as a burial ground for Norfolk's African American citizens on January 9, 1877. Calvary is a 68 acre outdoor museum of African American history in Norfolk. For nearly a century, most of Norfolk's African American citizens were interred at Calvary as there were no other burial options available to African Americans in Norfolk until the mid-1970s. Epitaphs document the lives of every level of African American society from doctors and lawyers, to sailors and laborers. Today, Calvary serves as both a place of remembrance and a chronology of the many important contributions of Norfolk's African American citizens to the history of our great City. Search for an interment in Calvary. Access a listing of Calvary interments. Learn about Norfolk Notables at Calvary. Watch a 2015 video tour of Calvary. See historic photos @ Tom Brickhouse's blog. Calvary Cemetery is in great need of conservation. Monuments have toppled; ledgers have become buried over time; and handmade, culturally significant monuments are deteriorating rapidly. Though we cannot save them all, we can preserve some with your help. Map-savvy volunteers are needed to assist with a cultural resource management (CRM) assessment for Calvary. 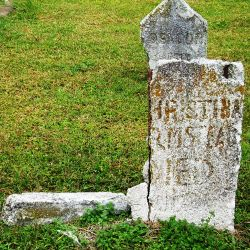 A CRM assessment will enable us to prioritize conservation projects while photographically documenting epitaphs, monuments, and other cultural objects for the historic record. If you are interested in volunteering to help conserve Calvary Cemetery, please click here.